Since the Monsoons are on. The lazy Sunday afternoon I was spending with the Boat Club Quiz Club in the COEP old canteen was brought back to excitement by Joseph’s proposal, that we go to some place called Tiger Tower Hill. All he knew about it was that it was a hill (duh!) near Kamshet. 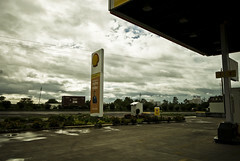 Monsoons, cameras and a new car was all the bait I needed to come along. 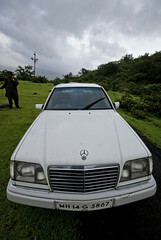 But then he bowled me a bouncer – Naren’s ’96 E-class would also join us! A smooth and quick ride on NH4 took us to Kamshet, where we stopped for a quick snack-break, and then asked the restaurant owner for Tiger Tower Hill. He told us it is near Lonavla. 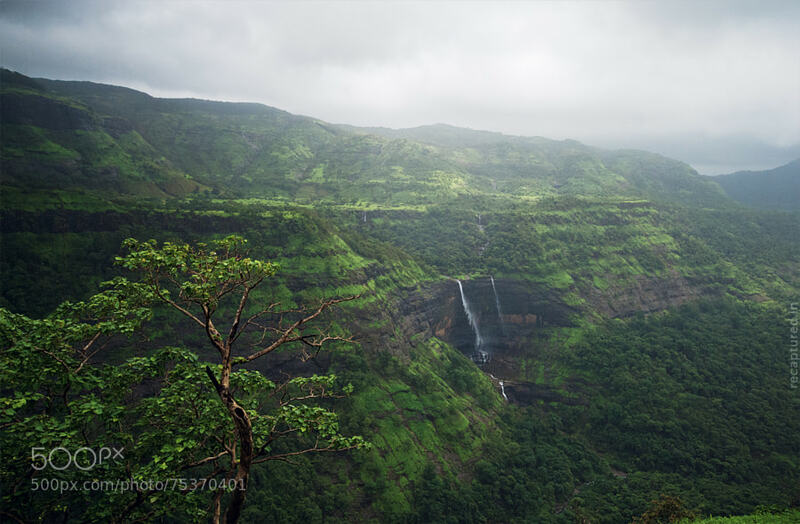 So we drove off towards Lonavla. What we saw on the road then was horrifying! A Corolla Altis had apparently been hit on the back by what seemed to be a humongous vehicle with great force. That force pushed it into the road divider. Both its boot and bonnet were smashed! Thankfully the two people in the car including the person driving it seemed to be safe and unhurt. This is where Joe got a call from Naren. He had seen a black Cedia cross him in the other direction, and he thought it could be us. Then they exchanged a few words about the Corolla as a reference point, and we met a few hundred metres from the spot of the accident. We drove back to Kamshet. Turned out that a lane next to the place we snacked at led to the Hill. So much for asking directions from locals! The road up to the Hill seemed to be okay. We kept wondering why Naren would describe it the way he did. Then we came to know. There was a detour from the road we were driving on, which was barely six feet wide. And this detour would have been done last a year ago maybe. And due to the rains it was kinda loose. Now we knew why he said that once you are on, you can’t reverse. Since we were already some 50metres into this “road”, the only way to go was forward. So we did. A narrow road with steep inclines, punctuated by expanses of flattish land with lots of grass, as you can see in the photograph, continued. On the way Naren gave up, his wiper was not working, and it would not be possible on such a road to get down and wipe the glass at any point. We spent some time discussing whether we go ahead – both the cars, whether we turn back – both the cars, or we go ahead – with all of us in the Cedia and the Merc standing where it was. Finally Naren decided to park his car with two of its wheels on the road, and we loaded all six of us in the Black Hawk. The Black Hawk rose to the challenge and carried all six of us forward, until at a point the incline became too steep, and we smelled its clutch burning! Four of the people in the car – the entire back crew – decided to trek to the top, while Joe and I stayed in the car and drove it to the top. A Thunderbird, a Pulsar 220 and a Scorpio were already parked at the top. The view was amazing! There was a trek that went further up, but we decided to stay where we reached, while Girish decided to go up. There was also a trek that went down – beyond the railing, on to a neighbouring hillock. Our four companions went that way, while we stayed back to admire the car and shoot it from every angle and perspective we could think of – wide angles, closeups, macros, high-hat, top view, sides, front, back. Apparently the spot down there on the hillock was amazingly windy. So the buggers stayed there until the sun went down. Joseph was getting impatient, because he had burnt his clutch and also because in the dark the road would be tougher to drive on. So we pushed off without our passengers, albeit at a slower pace, and asked them to come trekking down to meet us. We reached the parked Merc, divided the ‘load’ between the two cars equally, and started off back home. On getting to the proper road, Naren stopped again. His awesome wipers had now jammed in one place. One could not move them even by hand! After some time fiddling with the fusebox and connections, he gave up and concentrated instead on getting a test-drive of the Black Hawk. 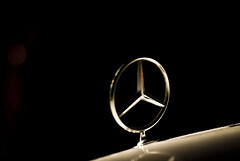 So Naren and Joe went off on a drive in the Cedia, while I went mad clicking the Mercedes – especially the three-pointed star. They came back, and we split ways — one car to Pune, one to Mumbai. On the way back, we found a place called Urban Spice. It looked good, so we went in, and ordered. The food was good too. And from there, I took over the Black Hawk. I drove back till Wakad. It’s such a smooth car! Feels just the way it looks – powerful yet refined. My flickr stream has not seen so many uploads in so few days since I guess I had discovered the cheap kit-lens macro method.